Do you need a new, masculine look? Black men have several styles of beards to choose from that are extremely popular right now, so have a look below and find the one that’s right for your face shape, style, and life. It’s no secret that there is something about a beard that exudes power and virility. Choose your new beard style by picking the look that suits your face and your lifestyle – a clean, well-groomed beard makes a striking impression on just about everyone. And if you really need an extra reason to grow a beard, well it can protect your skin from irritation and razor burn – a win-win situation, right? One of the fastest beards to grow is the Soul Patch. It’s basically just a small patch of facial hair under the bottom lip. It attracts attention to you without being a lot of facial hair to deal with. The Chin Strip is basically just a larger patch of hair in the exact same spot as the Soul Patch – it covers most, if not all, of the chin. 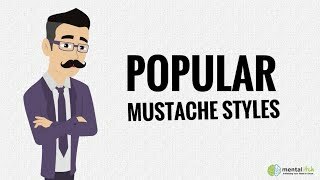 One of the most popular ways to wear this style is with a mustache, which turns the whole thing into a pretty slick, small commitment facial hair combination. Trimmer: Philips Norelco QS6160 StyleRazor Pro – With a trimmer on one end and a foil shaver on the other, this one is great for a beard style that still requires shaving most of your face. Razor (if you don’t like the electric shaver on the StyleRazor Pro): Gilette Fusion is probably the top pick here, but you can definitely use what you are using right now. Face Moisturizer: Jack Black Double-Duty Face Moisturizer – With a fair bit of shaving, you’ll be glad you invested in a good moisturizer. With more manly products coming onto the market, it’s not just for the ladies. Give it a try, you’ll look and feel like a million bucks. The scruffy beard is a killer look for African American guys who can pull it off, and it fits right in with today’s busy environment and a modern lifestyle. Want to know how to grow it? Don’t shave for 2 or 3 days – easy as that. A few days of stubble can also help to hide patches of skin where your beard doesn’t grow as well, since it’s all a bit messy and fairly short, anyway. This allows guys with slightly patchy facial hair the ability to still enjoy the glory of having a beard. This kind of thing has to be kept short, as it can turn into the beginnings of a full beard if you let it go for too long, which is a whole other look. Ever notice how more and more dudes (and celebrities) are rocking this laid back style? Yeah, women are also a fan of guys with a little bit of facial hair, so if you can pull it off, why not give this a shot? It’s easy and fast to grow, so you need to test it out. Trimmer: Philips Norelco QT4070 – Big length selection to get the trim just right, vacuum to collect the dropped hairs, and power boost to slash through even the coarsest hair. Oil/Conditioner: Virtu Beard Oil by Liberty Premium Grooming Co. – Your face can get dry and irritated beneath a few days growth. Keep your skin from being irritated and make your beard really stand out with this conditioning oil, it’s unreal. The full beard is a great look on any man who wants to go all in and assert his dominance. A man with a full beard is strong and intimidating. There’s even a bit of mystery surrounding a thick beard that covers most of your face. Keep in mind that this will significantly alter the look of your face, as it will make your jawline look much broader, so it’s not for everyone. This offers you a more filled outlook that’s great if you have a thin face and want to look broader and grown up. It’s important that you keep your beard neat and tidy unless you’re one of the very few lucky men who can get away with just letting their beard grow. Take Rick Ross’ beard for instance – it’s a pretty beastly beard, but he keeps it well groomed and maintained so he can get away with such an impressive facial hair display. Depending on the length, you’ll really need to get good with trimmers or scissors, but it is definitely worth it to have a beard of this caliber. Yes, we just said it’ll make you look more broad, but if you grow this out longer than your ‘average’ beard, specifically around the chin, it can actually lengthen your face, so it is a fairly versatile beard with a little bit of trimming practice. If you have long hair around the chin, it will make you look a bit slimmer – just test out various styles, know your own face, and remember that moderation and balance is key to finding the right style. Trimmer: Panasonic ER-CA35-K – With the longest length setting of any beard trimmer we looked at, this is the way to go for a nice full beard. You can get up to 40 mm on this model, which makes it ideal for keeping a thick beard tamed easily without needing shears or to visit the barber all the time. Shears: Utopia Care Professional Barber Razor Edge Hair Cutting Shears – Get good with these, because they are another great option for keeping your facial hair trimmed up and looking slick, even if it’s a few inches long. Conditioner: Virtu Beard Balm by Liberty Premium Grooming Co. – For a full beard you absolutely need to keep it maintained. Just like the hair on your head, you should be washing it and conditioning it properly to make sure it doesn’t start looking dry and scraggly. A Goatee and a Van Dyke are both modern versions of historical beards. A Goatee is technically limited to the chin area only. A Van Dyke is a Goatee with a mustache – often mistakenly called a Goatee. If you have a round or square shaped face, the Van Dyke or goatee is for you because it will elongate your face. The Van Dyke is a great choice if you want to stay classy, and it actually accentuates your mouth and chin, so if you want people to notice your mouth area and what you are saying, the Van Dyke is the look for you. Definitely, a great way to capture attention based on people’s subconscious need to look at the area of prominence – in this case, your beard. One of the most noticed Van Dyke wearers these days is P. Diddy. Van Dykes is a bit more upkeep because the cheek areas still need to be shaved, so having the right razor and trimmer handy is very important. Trimmer: Andis Outliner II – An insanely high quality model, this is great for any beard that requires a bit of fine tuning and edging. Oil/Conditioner: Virtu Beard Oil by Liberty Premium Grooming Co. – You won’t need a lot of this, and you may decide to bypass the oil, but it can really help keep everything fresh and clean and stop you from having dry skin, which can ruin the look of your well-groomed style. Best suited for thin faces, the Chin Strap is a is an example of a beard style that looks great on black men. Hard to give more of an explanation than the fact that it looks just like the name would have you believe, it’s basically an extension of the side burns that trace the outline of your face and goes down into your chin to create a beard. It absolutely has to be kept short for it to work and looks particularly good if you have a thicker beard – not great if you have patchy growth. Trimmer: Andis Outliner II or Andis T Outliner – These are really good models, made specifically for intricate and short beards that require really fine edging. They’re a favorite for barbers, so consider getting one of these to make sure you’re always looking slick. Face Moisturizer: Jack Black Double-Duty Face Moisturizer – You won’t have a lot of facial hair with this one, so it’s important to keep the rest of your face happy if you’ll be shaving it fairly regularly. This is a really manly brand, so don’t worry about that ‘moisturizer is for women’ thing. Seriously, it’s just like taking care of your hair with shampoo or your body with soap in the shower, just for your face. Can we help you with anything else? It’s time to learn how to keep your beard maintained to the highest standards by clicking here!